Good health and good sense are said to be the two greatest boons of life and a healthy lifestyle which includes a healthy diet is said to be the most significant key to achieve it. If you are committed to a healthy lifestyle and working hard to achieve a healthy body, then eating the clean and the naturally produced food should be quite high on your list of priority. They not only taste more delectable, but they are also a whole lot fresher. Although it is so beneficial you may not get organic fruits and veggies all the time everywhere. So if you have to just choose just one or two organic fruits or veggies that can have maximum positive impact on the environment, the health of your family as well as upon agriculture then do not look past apples. Apples are not only sweet, crunchy and filling but they can also protect against some serious ailments as part of a smart diet. Grave diseases like diabetes, heart disease and cancer can be averted by taking organic apples on a daily basis. Here are some major reasons why organic apples should be had regularly as they are your health’s secret weapon of protection. Just take a look. 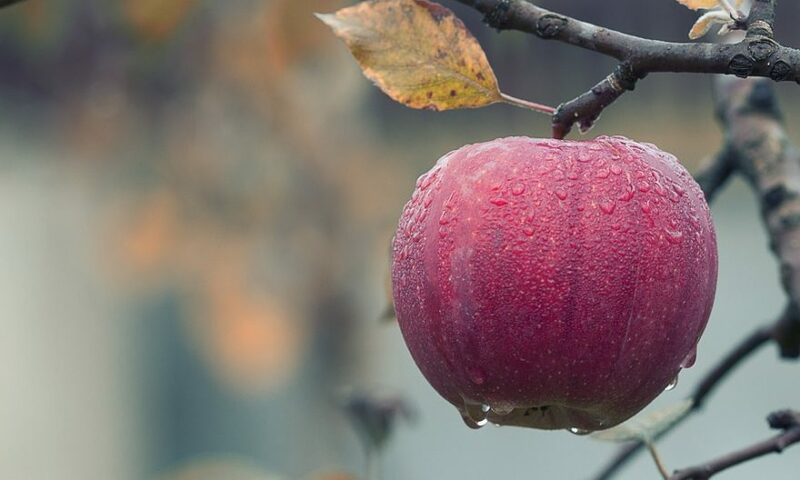 Research has revealed the fact that apples, irrespective of where they are grown, consist of the highest number of pesticides that can be as high as 48. With the only exception of cucumbers that consist of almost 69 different pesticides, apples contain very high number of pesticides that can wreak havoc on your health once consumed. So you should choose to have organic apples instead of the conventionally grown ones any day. Apples are highly beneficial for health and research has proved that it is true. Apples are one superfood that have been added to the list of foods that fight cancer. Triterpenoids and quercein are two of the major antioxidants contained in apples apart from vitamin C and fibres. All these play a vital role in slowing down the can cancer cell growth. Studies have brought to light the fact that sticking to the plant-based diet can help to prevent dementia. People opting for the Nordic Prudent Dietary Pattern (NPDP) are claimed to have better cognitive function than people opting for the processed and fatty foods. The non-root vegetables and fruits like peaches, pears and apples should be eaten in plenty according to the NPDP diet for a healthy body and mind. The MIND or the Mediterranean diet also recommends eating loads of fresh fruits including organic apples for higher cognitive functions. Hence for better brain health, having organic apples are a must. The organic apples are enriched with the vital nutrients that help to keep the immune system in great condition especially during the season of cold and flu. You will feel strengthened and keep ailments at bay by taking organic apples every day. Apples containing GMOs are on top of the most harmful non-organic fruits and veggies list. Many companies use GMOs for designing apples that do not turn brown. For that more pesticides may be required and you can well imagine the kind of harm that can be induced once you start consuming these apples. So always stick to organic apples in order make the most of these beneficial fruits. Research has revealed that people having organic apples every day have a 28 percent less risk of developing Type 2 diabetes as compared to the those who don’t eat apples. The diabetes risks are also lowered by more than 20 percent by those who have at least two servings of grapes, blueberries, and apples every week. The organic apples contain an antioxidant named Flavonoids that helps in this matter along with the fibres of the fruit that help to stabilize the blood sugar. Are you looking for a safe way to whiten and brighten he teeth? The organic apples remove the stains and bacteria from the teeth as they act as scrubbing brushes that also reduce your chances of going for frequent tooth cavity treatment. Malic acid that is contained in some teeth whiteners is also one of the constituent ingredients of apples. So if you want to keep your pearly whites happy and healthy then including organic apples in your regular diet is a must. The above are some of the major reasons why eating organic apples keeps you healthy. As they contain no chemicals and pesticides you can make the most what this magic fruit has to offer only if you opt for organic apples. Including one of them in your regular diet will ensure that you avoid various ailments naturally for the longest time.